The decision for a stem cell to make an exact copy of itself and maintain the same level of potency versus initiate a differentiation program is critical both during development and normal tissue maintenance. CBP and p300 are two highly similar proteins that play critical roles as “super-organizers” of transcription of genes. Because of their high degree of similarity, these two protein have long been considered as playing redundant roles in biology. However, despite their high degree of identity, they play distinct roles, particularly in regards to the Wnt/β-catenin signaling cascade and stem cell regaulation. Wnt signaling is very important in stem cell biology; however, there is no consensus as to the role of Wnt signaling in the regulation of maintenance of pluripotency/multipotency versus the initiation of differentiation in stem cells . Activation of canonical Wnt signaling induces the translocation of the protein β-catenin from the cytoplasm to nucleus. In the nucleus, β-catenin recruits either CBP or p300 to express various genes involved in stem cell regulation. Almost 15 years ago, our lab discovered the small-molecular Wnt modulator ICG-001. ICG-001 binds specifically to CBP but not to p300 and thereby specifically inhibits the CBP/β-catenin interaction and enhances transcription mediated by the p300/β-catenin complex (Fig. 1). Interestingly, ICG-001 induces differentiation in various stem/progenitor cells including cancer stem cells. A second generation CBP/β-catenin antagonist, PRI-724, structurally related to ICG-001, is being evaluated in multiple human clinical trials. Subsequently, we identified two small molecules IQ-1 and ID8, which indirectly antagonized the p300/β-catenin interaction. p300/β-catenin antagonists maintain stem cell potency, e.g. in mouse or human ESC and multipotency in other stem/progenitor cells. However, we were interested in discovering a specific direct inhibitor of the p300/β-catenin interaction. To achieve this goal, we anticipated that a direct p300/β-catenin antagonist would look somewhat similar to ICG-001 due to the very high degree of similarity between CBP and p300. Utilizing a combinatorial synthetic chemistry strategy, we identified two potent and direct specific p300/β-catenin antagonists, YH249 and YH250. These compounds had cellular IC50 values below 100 nM for inhibiting the p300/β-catenin interaction with >200 fold selectivity for inhibition of CBP/β-catenin. Direct binding to p300 was proven by affinity chromatography. As anticipated, these direct p300/β-catenin antagonists maintain the pluripotency of both mouse and human ESC and human induced pluripotent stem (iPS) cells in a Wnt dependent manner (Fig. 2). YH249/250 also blocked the differentiation of muscle stem cells even under conditions that normally cause differentiation. 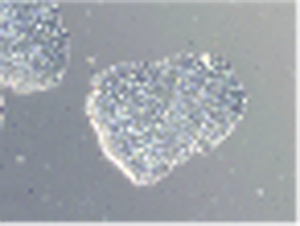 In dramatic contrast, ICG-001 forced the differentiation of these cells even under conditions that normally prevent differentiation. These results confirm that our previously described CBP/p300 coactivactor switching model that plays a very fundamental role in stem cell biology. YH249/250 also have potential therapeutic value to expand ex vivo stem cell populations (ESC and somatic stem cells e.g. cord blood stem cells) and somatic stem cells in vivo, without differentiation. These specific small molecule agents have also served as invaluable chemogenomic reagents to dissect the divergent roles of the extremely complex Wnt signaling cascade. Specific Direct Small Molecule p300/β-Catenin Antagonists Maintain Stem Cell Potency.